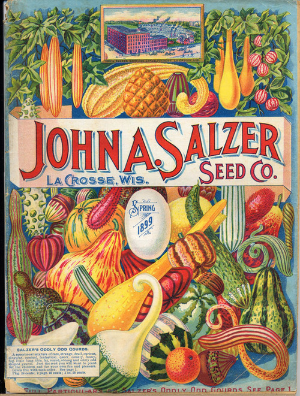 It's January and the seed catalogs are piling up faster than the snow drifts. With all those gorgeous pictures and lush descriptions, how is a gardener to choose? Here are some tips. First, do NOT dive into that pile and start filling out order forms. DO put on a coat and take a walk around your gardens. Even if there's a foot of snow on the ground, take the time to look at your annual beds, your vegetable garden, and the places where you want to put containers or hanging baskets. Make notes on how much room you have and what kinds of things might work well in each location. Consider where you have sun and where you have shade. Now, go back inside, fix a hot beverage and begin. No, don't begin with the catalogs. Start with your garden diary. You do have a garden diary, don't you? If not, at least collect those old order forms and half empty seed packets from last spring. Make a list of what worked and what didn't, which varieties you want to plant again and which you want to banish from your garden forever. Also make a list of things you want to try for the first time. I make it a policy to plant at least one new species or variety each year, just for the fun of it. Open Pollinated (OP) or Species: This is a variety that will come true from seed. If you want to save seed from your plants from year to year, look for these. Hybrid, F1 Hybrid, or X in the name: This is a cross between two pure-bred parents. Seeds from these will not come true the second year. Note that all hybrid seeds are F1, or first generation hybrids. Some plants may be F2 or second generation. These can only be propagated vegetatively. Height: How tall the plant will be. This is important for planning beds. You want short flowers in front, tall ones in back. Days to bloom, or bloom season: How long it will take a plant to flower or what month you can expect flowers. Note that this is based on the seed company test gardens. If they're in South Carolina and you're in Massachusetts, you may get different results. Still, this allows you to compare different varieties. Days to harvest: This is the same thing for food crops, and bears the same warning. For plants that are started indoors, this is the number of days from when the plants are set out into the garden. Disease Resistance: The term "disease resistant" is relatively meaningless if they don't tell you what disease they mean. Look for specifics, like VFN for tomatoes, which means resistant to verticillium and fusarium wilts and nematodes. Good catalogs will explain their disease abbreviations. Start Indoors: These are seeds that need to be started under lights or in a greenhouse before the last frost date. Think about how much seed starting space you have before buying lots of these. Direct Sow: These are seeds that can go straight into the ground. Check for the recommended planting date. Determinate/Indeterminate: Describe tomato plants. Determinate plants grow to a certain size, fruit all at one, and stop growing. Indeterminate plants are more vining and continue to grow and fruit until frost. Number of Seeds: How many seeds are you getting? Some catalogs will even tell you how much area or how many feet of row a packet will plant. Light Requirements: Does the plant need sun? Will it tolerate part shade, or does it need shade? Special Cultural Requirements: Some varieties need high or low soil pH. Some prefer dry soils, some like it damp. Some tall plants are fine on their own, others need staking. Decide if you can handle these special requests before ordering. Scientific Name: This is really important for flowers and herbs. With all those cutesy names out there, it's sometimes hard to tell what the plant actually is. Good catalogs give the scientific name, which will help if you want to look the plant up in a reference book or on the web. Finally, watch out for those shipping charges. Consolidate your orders with a few suppliers, or better yet, put together a joint order with your friends. And don't throw those catalogs away. It's fun to compare the pictures with what actually comes up and decide if a particular supplier is a better photographer than a seedsman.